The time has finally come! This week, I’m writing the part of my story that I’ve been looking forward to the most. This particular section of the plot was one of the very first scenes to come to me, which means it has been swirling around in my mind for well over ten years now. And it’s all inspired by that phrase up there (points up to title of post). 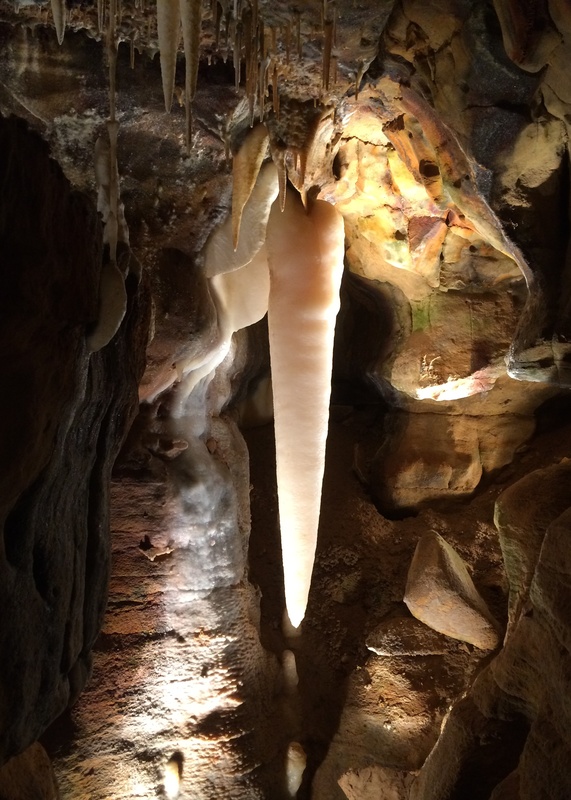 Earlier this year, I visited Ohio Caverns, both for fun and as a form of field research. I made a post about it when I first started this blog (before I knew how tags worked), so I thought now would be a good opportunity to revive it and re-share. So without further ado: Originally posted June 2, 2015. Today I visited Ohio Caverns, partially because I love visiting caves and partially as field research to gather information for part of Book 3 (hint, hint!). Ohio Caverns are limestone caves known for both the variety of stone formations present and the particularly brilliant colors of the mineral deposits. The formations within the cave are primarily composed of calcite, but there are iron oxide and manganese dioxide-based features as well. We went on both the Historic tour and the Natural Wonders tour. Each tour highlighted different features of the cave. The second tour we took was the Natural Wonders tour. There was ample lighting present which served to highlight the variety of colors within the formations. The calcite stalactites and stalagmites were the brightest white that I’ve seen in any of the caves I’ve visited so far. One, named the Crystal King (see rig, was particularly impressive. The Crystal King is bright white and is said to be one of the largest and most perfectly formed stalactites to be discovered. Ohio Caverns are also the only ones in North America to contain “dual formations”. Dual formations occur when one mineral formation grows on another formation that has a different chemical composition. Those in Ohio Caverns are iron oxide formations that calcite has grown on. Ultimately, the visit was enjoyable and gave me plenty of good material to draw from! Previous postNail Polish Sunday #2–This time with crystals! They really are beautiful. There is another cave not too far away that is even bigger and has more formations inside. Yes! In another set of local caverns they used to do weddings. It would be such a beautiful and unique setting for one! That would be an amazing setting! With a judicious application of money, carefully planned distractions, and a certain moral flexibility, almost any embarrassing document from one’s past can be made to disappear. Small, strategic fires are often best.